Korn have released their first new music in three years with new single Rotting In Vain. But is it any good? 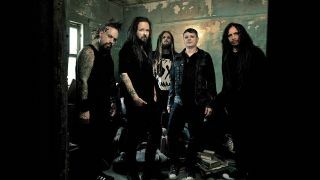 Three years on from the release of The Paradigm Shift, Korn are poised to return with their second studio album since the return of guitarist Brian ‘Head’ Welch. If the scything angst of first single Rotting In Vain is any indication, the nu-metal behemoths may be about to unleash an actual monster. Anyone that has seen Korn live over the last few years will doubtless have seen how much fun the band seem to be having right now, and you can see that exuberance reflected in the delicious warped Rotting In Vain video, with its frankly inexplicable narrative and some Olympic standard gyrating and gurning from Jonathan Davies and his veteran cohorts. With a chorus big enough to squash Dino Cazares and a wickedly self-referential burst of Davies’ trademark gorilla gibberish, Rotting In Vain sounds very much like a conscious return to the crushing riffs and refined accessibility of earlier Korn records like Issues and Untouchables. There is no dubstep wub-wub-wubbing or much evidence of left-field experimentation here, but despite being in the thick of their third decade as a band, Korn sound newly excited and ferociously focused. If the rest of new album The Serenity Of Suffering is similarly fresh and fiery, Korn fans will be awash with admiring froth when the record hits the streets in October. Korn’s new album The Serenity Of Suffering is out October 21, via Roadrunner Records.